Entrance to the East Meets West exhibit at Legion of Honor Museum. For a festive treat with plenty of sparkle I recommend the current exhibition at the Legion of Honor Museum in San Francisco, East Meets West: Jewels of the Maharajas from the Al Thani Collection. On now through February 24, 2019, this exhibit includes 150 pieces of stunning jewelry and other accessories from 17th century India to modern interpretations by western designers. Turban ornament, India c. 1900, Silver, diamonds, emerald, pearl. Much of what’s on view is from the private collection of His Highness Sheikh Hamad bin Abdullah Al Thani, including elaborate necklaces, strands of pearls, aigrettes, brooches, and turban ornaments – the most iconic of East Indian jewelry pieces. In the west, royal women bore the task of donning the family jewels but in the east it was the men who had the pleasure. Interspersed among the display cases are photos of various decked out Maharajas. These images give an idea of how they wore their finest jewels – chokers at the neck, layers of necklaces covering the chest with dangling stones as big as chandelier drops, brooches adorning their jackets, and to top it all off turban ornaments often featuring a large emerald, the favored gemstone for its green color. It seems the gentlemen wore their jewelry well and with surprising ease. Nizam of Hyderabad necklace. India, 1850-1875. Gold, diamonds, emerald, enamel. In the early 20th century, with their mutual love of jewelry and gemstones, both the west and east cultures borrowed from each other. European designers began to use cabochon and carved gemstones in their designs, which we see in Art Deco jewelry, and Maharajas brought their collections to houses such as Cartier to have them remade into modern designs. Pen Case and Inkwell. North India, 1575-1600. Gold, diamonds, emeralds, hubbies, sapphires, lacquer. With six galleries there is much to learn and perhaps get inspired … to add to our gift wish list! Elephant Brooch, JAR, Paris. 2016. Titanium, diamonds, white cacholong (common opal), sapphires, gold, platinum. East Meets West: Jewels of the Maharajas from the Al Thani Collection is a nice alternative to the holiday madness. Check it out. Your new hat is small … and round … and deep … made of melusine … the silky soft felt that is this year’s fashion sensation … in the subtle shades of a degas painting … flattering and romantic … from a collection … millinery, second floor. Agnes Farrell, fashion director & advertising director at Bullocks Wilshire, 1930s-1960s. Speaking of a Degas painting, there’s a little more time left to catch Degas, Impressionism, and the Paris Millinery Trade at the Legion of Honor in San Francisco. On now through September 24, 2017. For those of us who love our hats the current exhibit on at the Legion of Honor in San Francisco is a must see. Degas, Impressionism, and the Paris Millinery Trade is an exploration of hats in Paris reflected in the works of Impressionists including Degas, who himself came from a fashion oriented family, Renoir, Cassatt, Manet, and Toulouse-Lautrec among others. Degas, Portrait of Zacharian. 1885. Each of these artists took an interest in the making of hats and the women who wore them. Among the 40 works of art are images of milliners at work, hat shops, and women in conversation donning spectacular chapeaux often draped in ribbons or topped with colorful plumes. But what about les hommes? They are represented as well looking oh so dashing in top hats, bowlers, and boaters too. The array of paintings come from Musée d’Orsay, the Art Institute of Chicago, the J. Paul Getty Museum, the St. Louis Museum of Art and the Fine Arts Museums of San Francisco. Hats were an essential accessory at the time for both men and women. Business was booming with 1000 milliners working in the city of Paris during the hat’s peak, 1875-1914. The hats themselves were glamorous as were the ladies who wore them, but for the milliners and shop girls life was hard work and long hours – a part of the story Degas in particular wanted to tell. I liked seeing the large and beautiful posters of the era by Toulouse-Lautrec, selling products with ladies in hats. In each room there are also display cases of hats. A collection of 40, including boaters and bonnets, bowlers and everyone’s favorite – the Picture Hat, which has a very large brim and is often adorned with lace, silk flowers, feathers, birds, you name it! The exhibit is a manageable size allowing for a second walk-around, if desired. The day I visited I was a little taken aback by what I fear might be a growing trend in museums – selfies and photos of oneself taken by another. There was an older woman all dolled up in a hat, who asked other attendees to take a photo of her in front of EVERY SINGLE piece of work in the exhibit. My friend and I were looking at one painting when this woman walked right in front of us and stood by the piece, posing for a photo completely oblivious to our presence. A group of young girls were darting around taking selfies in front various works. It was an interruption to our experience and I have to wonder if these photo-hounds have any real interest in art. I understand that museums are trying to appeal to everyone and apparently allowing selfies is one way to get people in the door, but at what cost? I think we have a problem when it becomes all about the viewer and the art is simply a background for someone’s photo. That aside, as an appreciator of art and museums, and one mad woman for hats, I thoroughly enjoyed this exhibit. Degas, Impressionism, and the Paris Millinery Trade on now through September 24, 2017 at the Legion of Honor in San Francisco. What Ms. Wilsey is referring to are the exquisite fashions chosen for the exhibit High Style: The Brooklyn Museum Costume Collection now showing through July 19, 2015 at the San Francisco Fine Arts Museums Legion of Honor. With over 125 pieces of clothing tracing the history of women’s fashion, High Style offers a broad and balanced view of fashions from the early to mid-20th century. The pieces were selected from the vast collection at the Brooklyn Museum, which opened in 1903 and is the earliest, and considered the most distinguished, holder of fashion designs. In 2009 the Brooklyn Museum partnered with the Metropolitan Museum of Art, New York. 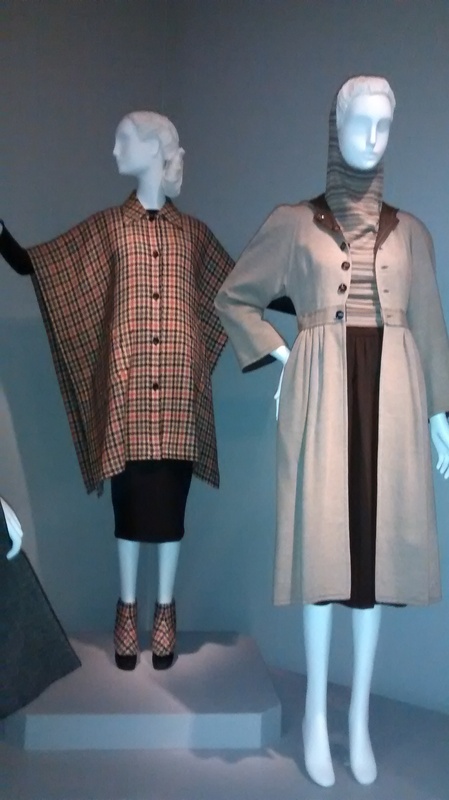 Left: The Tweed Toga by Bonnie Cashin, 1943. Right: Ensemble by Claire McCardell, 1946 (first hoodie?). Included in High Style are ball gowns and party dresses, sportswear and accessories. Examples are on view of French couture by Christian Dior, Jeanne Lanvin, and Madeleine Vionnet as well as ready-to-wear by American designers Bonnie Cashin, Claire McCardell, and Gilbert Adrian among others. There are also several pieces by the one and only Elsa Schiaparelli, who was known for adding a dash of surrealism to her designs in the 1930s. The Cloverleaf Dress designed in 1953 by Charles James. It weighs 10 lbs., made of layers of different fabrics including satin and lace. Despite its rigid look, it’s very pliable and is designed to have a lilt when dancing. 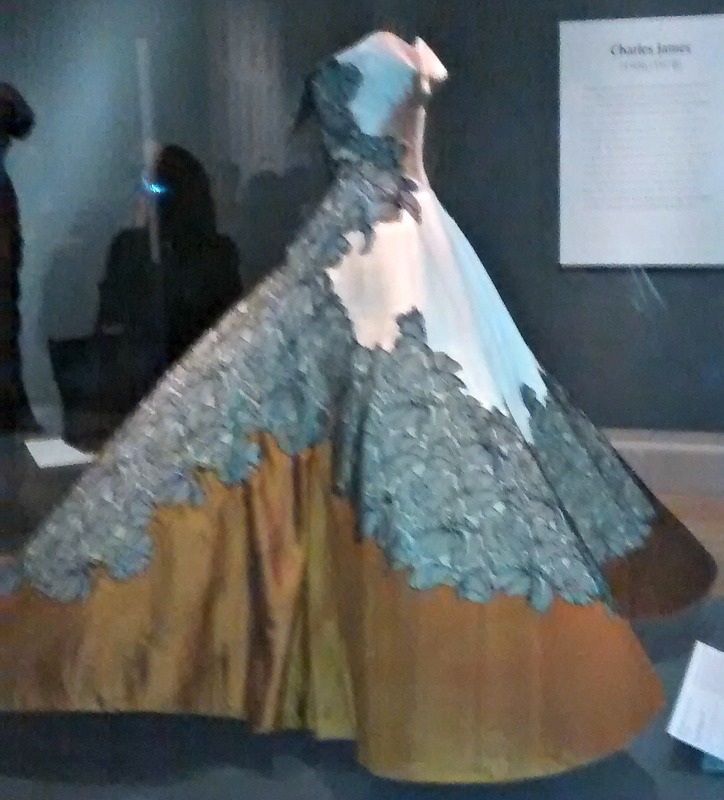 Of the six fashion-packed rooms, one is devoted to Charles James (1906-1978), a British born American designer who considered himself not a dressmaker but an artist. He was known for hobnobbing with American socialites and designing their unique ball gowns. Mr. James’ pieces, in contrast to the rest of the exhibit, stand erect like sculptures and independent of mannequins. (Allowing us to perhaps imagine ourselves donning such luxury.) For this effect, High Style uses specially built structures inside each gown. What a treat to view such impressive craftsmanship and artistry, about as up close as most of us will ever get. High Style is a must-see for fashion students, designers, and anyone who is interested in clothing construction as well as fashion history. I suggest spending the day, take time and walk through at least twice to catch the details. 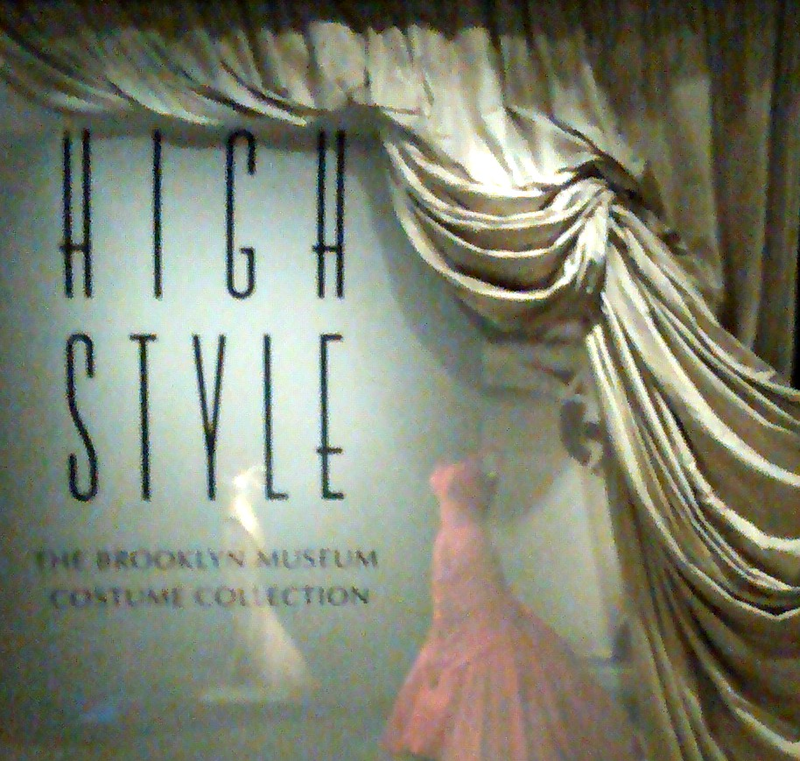 High Style: The Brooklyn Museum Costume Collection – don’t miss it! Good news for slow pokes who haven’t yet made it to Pulp Fashion: The Art of Isabelle de Borchgrave at the Legion of Honor in San Francisco – the popular exhibit has been extended through June 12th. A cross between art and fashion history, Pulp Fashion features over 60 historical costumes made entirely of paper by Belgian artist, Isabelle de Borchgrave. de Borchgrave is a trained painter with a fondness for textiles. 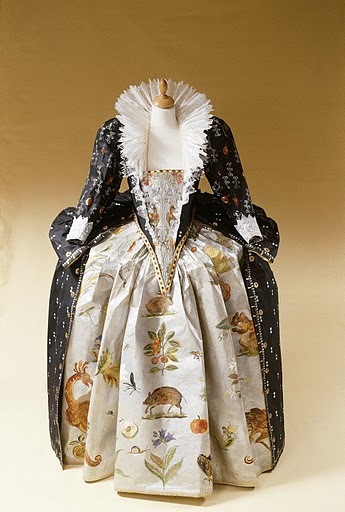 In 1994 she began using paper to recreate costumes from early European paintings. The Legion of Honor is the first U.S. museum to host a retrospective of de Borchgrave’s work. And one room is devoted to the Spanish designer and artist Mariano Fortuny. In addition, de Borchgrave has created especially for this exhibit four costumes inspired by paintings from the Legion of Honor permanent collection. de Borchgrave uses plain pattern paper that she stencils and/or paints with acrylic ink and shapes into clothing. (For lace she uses lens cleaning paper.) She says she uses paper for its simplicity and purity. Her craftmanship is impressive to say the least and in photographs de Borchgrave’s paper costumes appear real, however, in person they look like what they are – artistic renderings of clothing. This is worth noting as the paper medium highlights certain qualities of the costumes that fabric might not. 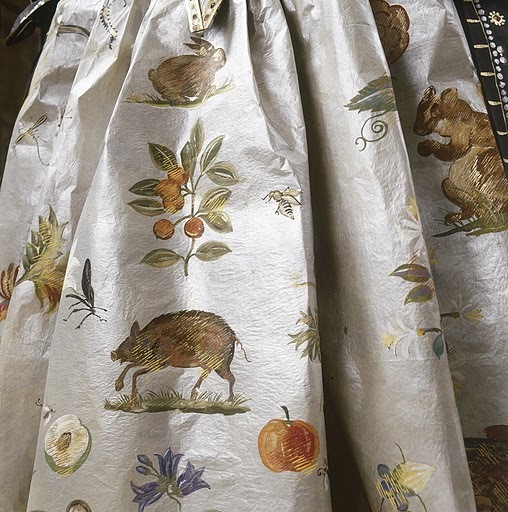 For example, the images on Queen Elizabeth I court dress are more striking than its voluminous shape and the detail of a cord belt or a line of slender buttons on a Fortuny tunic catches the eye more so than the famous pleats. Given that we are looking at paper rather than fabric, we are looking more closely and differently, therefore perhaps finding new things. Pulp Fashion is worth a visit to experience historical costumes come to life in an unexpected medium. Bring a group of friends along for a post visit discussion. Pulp Fashion: The Art of Isabelle Borchgrave runs now through June 12th at the Legion of Honor, 100 34th Ave., SF. Click here for more scoop.